Of more than 55 species common in the U.S., the majority build their nests underground. The subterranean termites are extremely destructive, because they tunnel their way to wooden structures, into which they burrow to obtain food. Given enough time, they will feed on the wood until nothing is left but a shell! 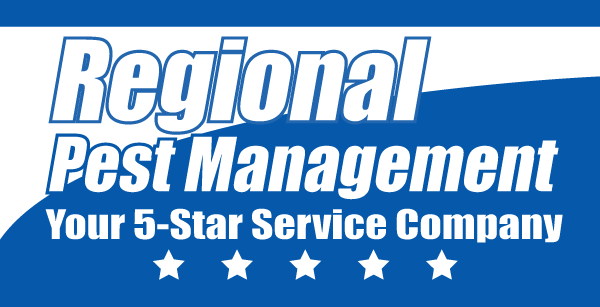 For warning signs on termite infestation, select this link. The experience of homeowners nationwide shows that no home, new or old, is safe from termites. By building mud tubes, termites can cross concrete, brick, cider block, metal termite shields, pretreated wood, or any barrier other than a professionally - applied termite treatment. Even if you haven't seen swarming termites, or any traces of damage, your home may still be in danger. When a colony swarms, the winged termites may be in the air for just a few minutes and you may not see them. Termites also eat wood from the inside out, making their activity detectable only by professional termite inspection. 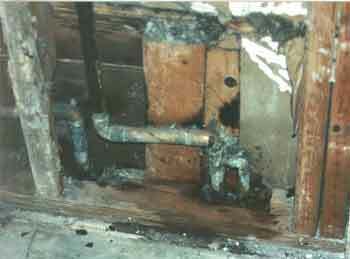 If you do nothing, the termites will continue to eat and cause damage, until only the outer shell of the wood is left. At some point, structural damage occurs. TERMITE is the common name for numerous species of social insects, comprising the order Isoptera, that can damage wooden structures such as furniture or houses. Of about 2000 known species of termites, most are distributed in tropical countries, and some inhabit the temperate regions of North and South America; two have become established in southern Europe. Termites are known also as white ants, a misnomer based on superficial similarities in the appearance and habits of these two insect groups. True ants belong to a more advanced insect order, the Hymenoptera, which includes also the bees and the wasps. For a comparison chart showing the difference between a termite and an ant, select this link. 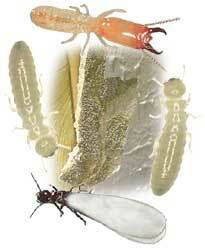 Termites are relatively primitive; they have thick waists and soft bodies and undergo incomplete metamorphosis. Nevertheless, they have developed remarkable patterns of social behavior that are almost as elaborate as those of the ants, social bees, and wasps. No solitary termites exist. A colony may number from 100 to more than 1 million termites. Excluding the immature forms, called nymphs, a colony consists of several structurally differentiated forms living together as castes with different functions in community life. In socially advanced species, three principal castes exist: the reproductives, the soldiers, and the workers. Both the reproductives and the soldiers occur in two or three distinguishable forms, each specialized for a role in the division of labor in the colony. All forms comprise individuals of both sexes, but only in the reproductives do the sexual organs undergo complete development. Among the reproductives are dark-colored males and females with fully developed wings and compound eyes. At maturity, they leave the parental nest in swarms. After the flight, they shed their wings and mate. A new colony is then established by a male and female who become primary reproductives, that is, the king and queen, whose sole occupation is the production of eggs. Termite kings and queens are longer-lived than other termites, and the queens are larger than other members of their colony. In certain tropical species, the king and queen live for ten years, and the queen grows to an enormous size, sometimes as much as 20,000 times the size of the worker. The abdomen becomes so distended with eggs that the queen is unable to move about. The eggs are laid at a prodigious rate that totals about 30,000 a day in some species. Most termite colonies have only one royal pair. Apart from the reproductives, all castes are sterile and wingless and have whitish bodies. Typically, the worker caste is the most numerous, and workers are the smallest of the adult forms. Workers build and provision the nest, tend the eggs, and feed and groom all the other members of the community. In some species, no true worker caste exists; undifferentiated nymphs do the work in these colonies. To defend the colony, all species have soldiers with greatly enlarged heads. In some species, the soldiers are equipped with huge jaws; in others, they have long snouts that can eject a sticky, poisonous substance to render an enemy helpless. Caste differentiation was long believed to be hereditary, but investigations have since demonstrated that nymphs may develop into specialized forms as the need arises within the colony. Hormonelike substances secreted at the body surfaces of the royal pair serve to inhibit the production of primary reproductives. These substances, which are licked off by the workers during grooming, are transmitted, probably with food, to the other members. In the absence of these inhibitory exudates after the royal pair dies, nymphs at a particular stage in their molting cycle rapidly develop reproductive organs and become fertile. A similar process operates in maintaining the required number of soldiers in the community. Termites feed mainly on wood or other materials containing cellulose. The cellulose is partially digested by protozoans living symbiotically in the intestines of the worker. Enzymes produced by the protozoans break down the cellulose into components that can be assimilated by the termites. Digested cellulose is distributed by the workers to members lacking the protozoans. Some species feed on vegetable molds that they cultivate. Others obtain a fluid secreted by beetles known as termitophiles, that live as guests within the termite community. Termite nests, called termitaries, vary widely. The nests of certain tropical species are huge moundlike structures, often 6 m (20 ft) in height. These mounds have extremely hard walls, constructed from bits of soil cemented with saliva and baked by the sun. Inside the walls are numerous chambers and galleries, interconnected by a complex network of passageways. Ventilation and drainage are provided, and heat required for hatching the eggs is obtained from the fermentation of organic matter, which is stored in the chambers serving as nurseries.